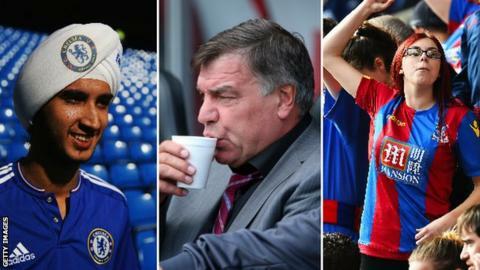 BBC Sport contacted 227 clubs for the Price of Football study but who sold the dearest cup of tea? The average cost of the cheapest match-day ticket in the Premier League has passed £30 for the first time, the BBC's Price of Football has found. In the top flight, 11 clubs put the price of this ticket up, contributing to a 6.54% year-on-year rise. It now averages £30.68, up from £28.80. The most expensive match-day ticket fell slightly to an average of £56.63. In the season ticket category, both the cheapest and most expensive rose about 1% to £513.95 and £886.21 respectively. That works out at £27.05 and £46.64 a game. Click here to play with the Price of Football calculator and see what your support is costing you. The study, which also gathers prices for pies, programmes, tea and away tickets across the UK, found replica shirt prices rose 4.8% year on year. Premier League clubs released 50 outfield strips this summer and a home jersey bought in a club shop will now cost an average £49.68. Swansea were the only club out of 227 in 13 leagues across the UK who declined to take part in the study. So are prices going up across the board? Fans have largely seen prices remain the same or drop this season, as BBC Sport's study found 51 of the 76 ticket prices analysed dropped or remained the same. The Premier League said this shows clubs are "working hard to keep grounds full" and "doing a good job with record occupancy at 96%". As in 2014-15, no Premier League ticket is above £100, with Arsenal (£97) and West Ham (£95) most expensive. But more than a third of the clubs sell a match-day ticket for £25 or less during the course of a season, with Leicester City's £22 offering the cheapest. The Premier League says BBC Sport's focus on individual match tickets is "misleading" as 66% of fans use season tickets. Of the teams who remained in the Premier League from 2014-15, only West Brom raised the cost of their cheapest season ticket, citing the "competitive realities" of the competition for their £50 hike. Prices range from £294 at Stoke City to £2,013 at Arsenal, though the Gunners' season tickets include seven cup fixtures and the London club say most fans pay between £1,000 and £1,100 for a season pass. According to its own study released last week, the Premier League say season ticket holders paid an average of £32.50 for adults and £10 for juniors to watch matches. And clubs in the top tier are keen to grow the number of young fans at their stadium, with the likes of Crystal Palace offering a junior season ticket for £95, Liverpool for £180 and Everton admitting under-11s for £5 a game. West Ham, who sell their cheapest at £617.50, have promised to cut all season ticket prices upon moving to the Olympic Stadium next season, with some available for more than £300 less. Clubs no longer have a voluntary agreement to keep home shirts for beyond one season, so every club changed at least two kits this summer, with 10 teams releasing three. Manchester United's £60 adult shirt is a league high and their junior option at £45 outstrips a £38.42 division average. At the Old Trafford club, it costs £118 for a full adult strip, including shorts, socks, and a printed name and number. A junior strip is £103. Kit manufacturers, including Adidas and Nike, told BBC Sport that the cost of researching and manufacturing scientific materials were significant in pricing. Bournemouth's £40 adult shirt and Norwich's £28 junior shirt are the cheapest in the Premier League. The average pie costs £3.35 in the top flight, up 1.82%, while a tea is £2.09, down 2.84%. A programme is £3.42 on average, up 6.77%. The most expensive brew in England is Liverpool's £2.50 cup, while Crystal Palace say their pie is produced by "an artisan baker" at a cost to the public of £4 - a joint high with Manchester City. For the first time, Price of Football gathered away ticket prices. Clubs told us the average cost of the cheapest ticket they offered away fans during the first six home games of the season was £30.28. The dearest away ticket in this period cost £46.44 on average. Both figures exceed the Football Supporters' Federation's campaign, which wants to cap away tickets at £20. However, 16 of the 19 clubs have subsidised the cost of tickets for their own travelling fans in the last year. Children's prices, senior rates and student offers allow clubs to focus pricing on specific sections of their fan base and many offer deals and initiatives during the campaign. Tottenham chartered two flights to Newcastle for fans at the end of last season, charging just £2.51, while the Magpies have committed to sending disabled supporters on two free away trips each year, including food, travel and tickets. Arsenal told the BBC they reduce more than 350,000 tickets in price during the campaign and Watford consider fans who travel to Vicarage Road, offering a discount on season tickets of over £100 if your journey is more than 75 miles. Will prices rise or fall in the future? In the five seasons in which the BBC has run its Price of Football study, the cost of a cheap match-day ticket has risen by £5.12 - around 20%. The cheapest season tickets are up 16% in four years. Clubs point to savings made elsewhere, with Everton referencing just a £2 rise over 10 years in some of their concessionary season tickets. But how will changes in the football landscape impact things? The most recent analysis of Premier League clubs' finances, found clubs made pre-tax profits of £187m, the first profit since 1999. In addition, the league's wages to revenue ratio fell from 71% to 58%, the lowest since 1998-99. From next season, a bumper new television deal worth £5.136bn starts in the Premier League and will bring clubs tens of millions in extra revenue. Even the club which finishes 20th will earn an estimated £100m, up more than £30m. You can download the full results for 2015 here (pdf 536 KB). Read more on Price of Football Quiz: Are these deals true or false?